The balance between human development of natural resources and human stewardship of pristine restored habitats often falls prey to tensions. 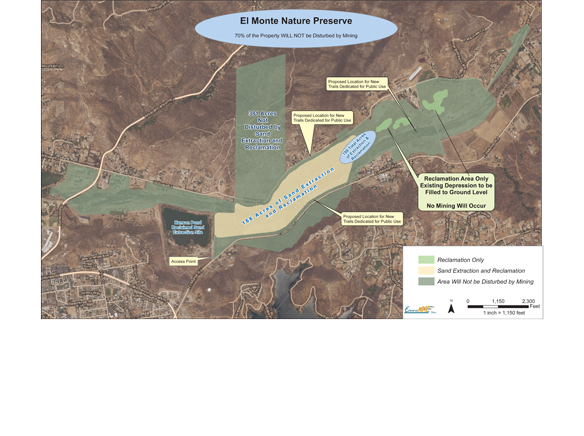 The planned El Monte Nature Preserve is no exception, despite its proponents’ efforts to build environmental reclamation and expanded recreation uses into a Lakeside sand mining operation that is scheduled to begin in 2016. El Monte Preserve is the repurposed organization that arose from the former El Capitan Golf Club. The group recently rolled out its El Monte Sand Mining and Nature Preserve Project, which is designed to extract construction-aggregate, high quality sand deposits in the Lakeside’s El Monte Valley, in conjunction with phased restoration of the local habitat and improvement in the equestrian trail system off walking paths near the eastern stretch of the San Diego River. 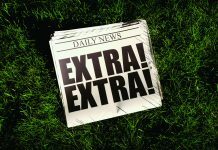 The Lakeside Community Planning Group received a presentation about the project on June 3, as the project developers and community planners continue soliciting community reactions while the project is moving forward. Crystal Howard, spokeswoman for the El Monte Preserve sand extraction and reclamation, responded in turn. She said that the enterprise she represents is in the process of reaching out to members of the Lakeside community, soliciting specific, detailed requests for how residents want the reclaimed lands to be redesigned for recreation and habitat restoration uses. 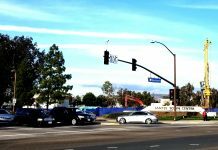 Despite being rebuffed from the planning group’s trails subcommittee, El Monte project designers will be seeking more input from Lakeside and nearby East County residents about desired trails and recreation areas as the project moves through its planned phases. Howard pointed dually to current needs and to future promises. “San Diego County is in dire need of local sand” for construction and infrastructure, she explained, because “everything that is built” requires such high quality sand. Moreover, as a high bulk, low value product, when construction sand must be moved over 30 miles, the transportation costs overrun the sand’s value as a product. Construction sand can thus range from $8 per ton when acquired locally, jumping to $20 per ton if imported over longer distances. And those built-in, necessary construction costs then drive up overall totals for anything and everything that is being made. Such mineral deposit sand is a primary component of Portland Cement Concrete, asphalt, plaster, and stucco, providing between 80 to 100 percent of the material volume in these compounds. Over the 30 years from 1981 to 2010, California averaged use of 180 million tons of construction sand per year, about 5.7 tons per person annually. Howard further described the lack of existing sand extraction sites. San Diego has about 14 quarries, according to Howard, and none contain high quality sand. Millions of tons of construction-grade sand must be imported into San Diego each year, from such far-flung places as Mexico, Los Angeles County, and San Bernardino County. That adds up in elevated transport truck emissions damaging to local air quality as well as wear and tear on roads, which could be avoided if San Diego had local sources for quality sand that can be used for concrete, blacktop, and other construction materials. Lakeside holds six concrete manufacturing sites, which would experience significant reductions in sand deliveries once the El Monte extraction is underway. Howard detailed how important this planned project is in California’s economy. 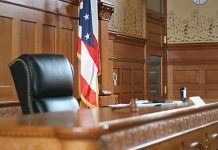 She noted that the State Mining and Geology Board has declared the El Monte sand a “significant resource” for infrastructure, with specific zoning for mineral mining, which any city or county is required to protect in that designation. The El Monte Nature Preserve will exercise an option to acquire the 580 acres of the property from the Helix Water District, with plans to extract sand from 30 percent of the area, in phases of mining over 15 years. Howard expressed the enterprise’s intent to address residents’ concerns and mitigate foreseen difficulties proactively. To avoid potential dust problems, the plans call for watering and implementing a dust control plan. In reducing noise pollution, the access road will be lowered 10 feet, so that operations have reduced impact on the community for sight and sound from the sand mining. The project planners will be conducting dust, noise, traffic, and biological studies to identify and preclude difficulties to the area. And for the future, after the mining operations are completed, what should Lakeside residents and visitors expect? Howard cited as a model the Walker Trail and Preserve in Santee, which opened with official ceremonies in late April. That had been another San Diego River area sand mining operation, supplying RCP Block & Brick, and is now acclaimed as an award-winning reclamation endeavor. Industry magazine Aggregates Manager tapped the 1.3 mile long Walker Trail and Preserve as its top prize winner in this year’s second annual reclamation project photo contest. Community opponents of the project will be holding a public gathering to discuss their concerns later this month. The El Monte Nature Preserve planners will be submitting further notices and preliminary reports in August.